The above Bible quote is one of my favorites. And yes, I am a crazy leftist liberal who reads the Bible (occasionally). I find inspiration in it in the metaphoric sense, not literally. But as is often the case when I start typing, my mind is ahead of my fingers and I jump ahead. Let me start over. The above photo was taken last evening, I saw it at just the right time. I was on my way home from my second job and feeling depleted physically and spiritually. Physically from working too much, not getting enough sleep, and having a cold; spiritually from the uncertain times in which we live. If you are on Facebook then your feed, like everyone's, is likely filled with mostly posts about politics. And the negativity after a while really wears me down. It helps when I focus on good (hence the above quote). I of course am not immune to the negativity. While I've made the personal commitment to not join in with the onslaught of it on Facebook, I still get caught up in it in conversations at work and else-wear. The fear turns to anger, but it is still fear. I am convinced of this. But there are reminders everywhere, all we have to do is look. 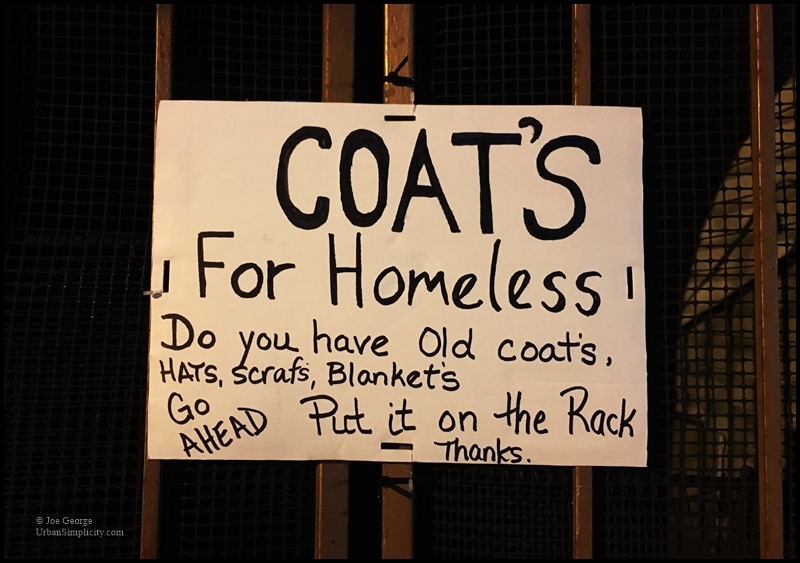 And sometimes I believe they are placed right in front of me just when I need them most, such as the above sign attached to a fence on a building I passed last night. 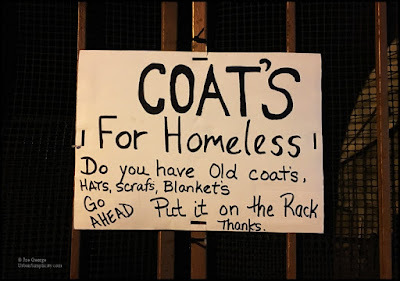 Do you have an extra coat? leave it here and we will give it to someone in need. Simple, right? Isn't that what life should be about? The photo just below is the local chapter of Food Not Bombs, which cooks and feeds people for free twice a week year round, no matter the weather. The second photo below is a building I pass a few times a week on my way the coffee shop (where I type these words). 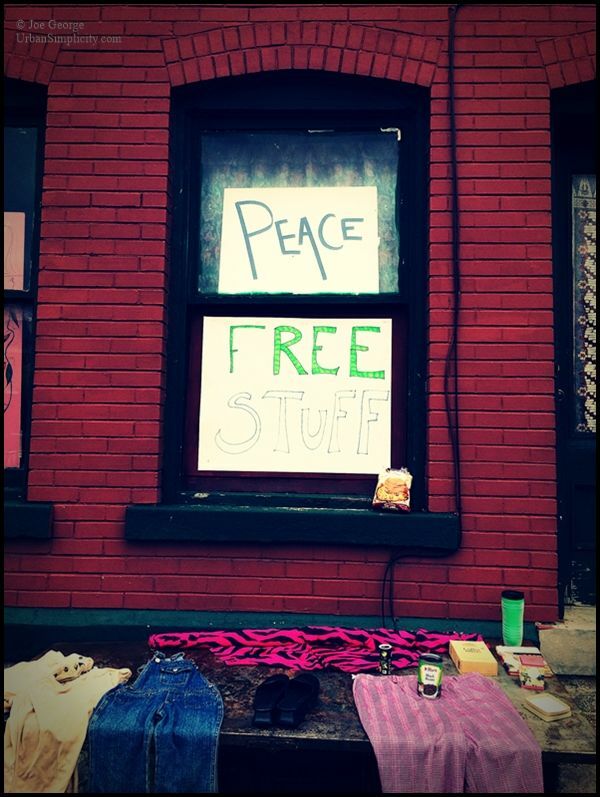 They have a table outside on the sidewalk and offer free things to whoever wants or needs them. The next photo is the Homeless Jesus statue in downtown Buffalo. 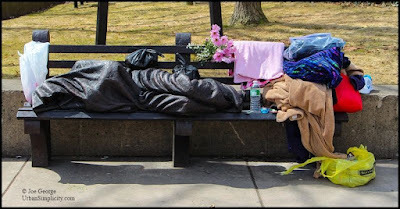 People leave clothes, sundries, and food for the homeless year round. And my personal favorite is the bottom photo. I was walking to the corner tavern one evening last month when I saw the note taped to a gate in front of a neighbor's house. 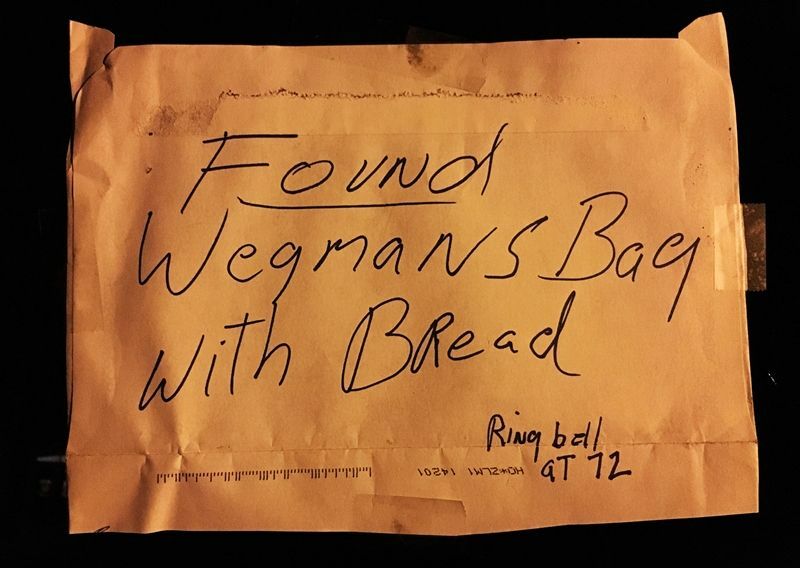 Someone had apparently dropped one of their bags and it had a loaf of bread in it and the neighbor held it for return. Simple acts of kindness with profound results. There are countless other examples of good happening all around us, these are just a few. And while I post these as a share to you, they are really (selfishly) for me. I have to remind myself to focus on the good (and I need constant reminders). Light always overcomes darkness, we simply need to seek it...to become the light.